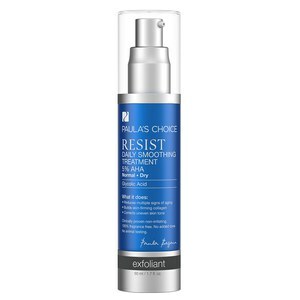 Combat dullness with Paula's Choice Resist Pure Radiance Skin Brightening Treatment, an innovative, lightweight formula that works to enhance natural radiance whilst addressing signs of ageing. Blending a complex of vitamin and plant-based ingredients with skin repairing antioxidants, the treatment gets to work on brown spots, uneven patches and areas of dullness to revive the appearance of lack lustre skin, refining skin tone whilst smoothing the look of wrinkles for a younger, healthier looking complexion. With continued use, unruly brown spots are diminished and prevented from returning. Skin looks brighter, more even and youthful. - K.N. Apply a small amount once or twice daily before moisturising. Aqua, Cyclopentasiloxane (silicone slip agent), Dimethicone (silicone slip agent), Acetyl Glucosamine (skin-repairing ingredient), Niacinamide (cell-communicating ingredient), Butylene Glycol (slip agent), Silica (slip agent), Glycerin (skin-repairing ingredient), Phenyl Trimethicone (silicone slip agent), Tetrahexyldecyl Ascorbate (stabilized vitamin C/antioxidant), Morus Bombycis (Mulberry) Root Extract (antioxidant plant extract/melanin inhibitor), Morus Alba Root (WhiteMulberry) Extract (antioxidant plant extract/melanin inhibitor), Glycyrrhiza Glabra (Licorice) Root Extract (antioxidant plant extract/melanin inhibitor), Ceramide 1 (skin-repairing ingredient), Ceramide 6 II (skin-repairing ingredient), Ceramide 3 (skin-repairing ingredient), Scutellaria Baicalensis Extract (antioxidant/anti-inflammatory plant extract), SaxifragaSarmentosa Extract (antioxidant/anti-inflammatory plant extract), Phytosphingosine (cell-communicating ingredient), (skin-repairing ingredient), PEG-10 Dimethicone (sillicone thickener), Cholesterol (skin-repairing ingredient), Panthenol (skin-conditioning agent), Vitis Vinifera (Grape) Fruit Extract (antioxidant), Tocopheryl Acetate (vitamin E/antioxidant), Bisabolol (anti-irritant), Bis-Phenylpropyl Dimethicone (silicone skin-conditioning agent), Dimethicone/Vinyl Dimethicone Crosspolymer (silicone thickener), Pentylene Glycol (skin-conditioning agent), Sodium Lauroyl Lactylate (emulsifier), Polysorbate 40 (emulsifier), Polysorbate 80 (emulsifier), Xanthan Gum (thickener), Ammonium Acryloyldimethyltaurate/VP Copolymer (film-forming agent), Sodium Acrylate/Acryloyldimethyl Taurate Copolymer (polymer), Carbomer (gel based thickener), Isohexadecane (dry-finish solvent), Hexylene Glycol (solvent), Polymethyl Methacrylate (film-forming agent), Mica (mineral pigment), Titanium Dioxide (mineral pigment), Disodium EDTA (chelating agent), Caprylyl Glycol (preservative), Ethylhexylglycerin (preservative), Phenoxyethanol (preservative).